The main building provides a formal civic presence along the street and a formal gateway into the school and the Main Quad. The building includes classrooms, learning resources center, administrative offices and the Community performance auditorium with full stage and theater facilites. The building is flanked by and connected to classroom clusters. 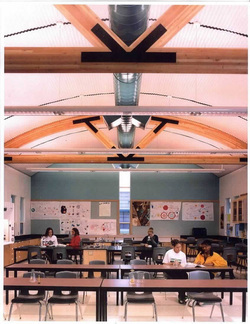 On the south are general purpose classrooms, including relocatable classrooms. On the North are the arts clusters including finearts, dance, music and culinary arts.